For anyone planning to restore native tallgrass prairie, a visit to the Matador Wildlife Management Area (WMA), located near the southeastern corner of the Texas panhandle, may be in order. Over the past 14 years, the Matador WMA, which was purchased in 1959 by Texas Parks and Wildlife Department (TPWD) as a research and demonstration area for the Rolling Plains ecosystem, has taken a holistic approach to restore its grass savannas and riparian areas, which include cottonwood forests that serve as roosts for Wild Turkey. In 2011, a catastrophic wildfire burned through, killing 85% of the cottonwoods that had a dense understory of redberry juniper and tamarisk but leaving most of the other cottonwoods intact. In order to reduce the concern of fire within these forests, it became a top priority to reduce the invasive woody shrubs. Pre- and post-grubbing, 2015. Courtesy of Matador WMA. 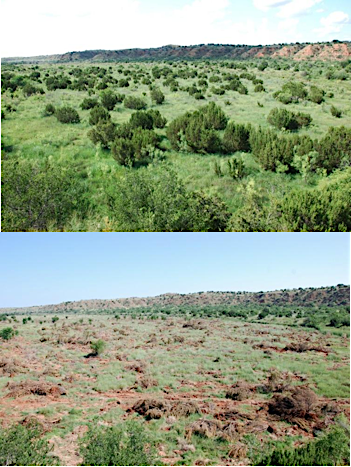 TPWD partnered with National Wild Turkey Federation (NWTF) on a multi-year restoration project, leveraged the NWTF funds 3:1, and restored 182 acres of riparian vegetation by removing the tamarisk, mesquite and juniper understory. But removing invasives in the riparian areas was only one part of the project. In order to protect these areas, it was critical to also remove shrubs in the surrounding grasslands, which increases the amount of water flowing into the riparian areas and decreases the likelihood that wildfire will enter the riparian zone. Matador staff used a number of techniques to remove shrubs (i.e chemical application, mechanical excavation or grubbing, and knocking down dead standing skeletons from previous chemical treatments) and where needed, reseed with native grasses and forbs. The grassland restoration also allowed prescribed fire to be used on larger areas within the WMA, areas which hadn’t seen fire in over 20 years. Instead of prescribed burns covering 100-200 acres, they now cover thousands of acres. As odd as it seems, fire that is so destructive in riparian areas rejuvenates grasslands. By removing the dense shrubs, more acres can be burned with manageable prescribed fires. Since 2004, the Matador staff have treated over 17,000 acres of woody shrubs and safely conducted prescribed burns on nearly 21,600 acres. The Matador staff are hoping these restoration practices will continue well beyond the WMA borders. To highlight the value of shrub removal and grassland restoration, the Matador hosts workshops and field tours where landowners can learn how these practices can benefit cattle operations. 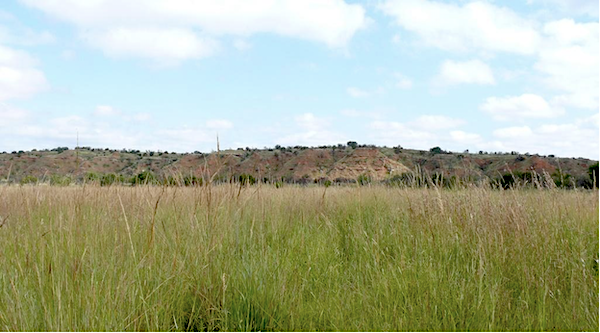 For more information about grassland and riparian restoration on the Matador WMA, contact Matthew Poole at 806-492-3405 or Matt.Poole@tpwd.texas.gov.